Photos and video by Forrest Anderson. The photo above is a composite. The video is a series of three time-lapses and a final still image. The biggest challenges in photographing nature are the things that are out of your control, which most often come down to the weather. There have been a number of lunar eclipeses in recent years, some in the middle of the night, but in my location they were shrouded partly behind clouds. The lunar eclipse of September 27 happened not only on a clear night, but also with a super moon, which occurs when the earth is closest to the earth in its orbit and therefor looks bigger. The result: a super blood moon. This combination hasn’t happened since 1982, and the next one won't happen until 2033. It was a real treat to experience and photograph it on a clear night and at a decent hour. The weather being fine, my main challeng was exposure and showing the moon in context. Photographed badly, the moon can can look like a flashlight in a dark closet. Done right, it is quite amazing. My solution was multifaceted. The moon is lit the same way the earth is lit, by direct sunlight. Therefore, the correct exposure for the moon is very close to what it would be for a photograph on earth during the day. Sunlight is reflected off the surface of the moon, but during an eclipse, you are photographing the moon in deep shadow. This causes it to turn red - hence the name blood moon. As the moon broke over the horizon of the mountains to the east, my exposure was f4.0 @ 1/4 second at ISO 3200. I used this exposure until the eclipse began to wane and the brilliant light of the sun was reflected directly off the bottom of the moon. At this point the red color began to drop and the high contrast view of the moon that looked like something had taken a big bite out of it returned. At this point, I dropped the ISO to 400 and then to 125 and began shooting at 1/125. I then gradually worked up to 1/1000 at f4.0. As noted earlier, the moon by itself against a black sky either makes the moon look washed out or the moon is properly exposed and the sky completely black. I like to see things in context and my eye could see the mountains to the east, a dark sky with stars and an eclipse in progress. My mind did all the exposure adjustments for me. In order to replicate that experience, I wanted a view of the mountains and the night sky combined with the progression of the moon. For this, I used a second camera with a 50mm f1.8 lens, shooting at ISO 400 with an exposure of f1.8 for eight seconds. This provided the detail of the scene, but a washed out moon. In the context shot, the moon is so small and overexposed that it is difficult to see what is happening, so I created a composite of the context shot and representative images of the moon that I shot with a 300mm lens. I resized them so that they were large enough to be visible but not so large that they looked unnatural. 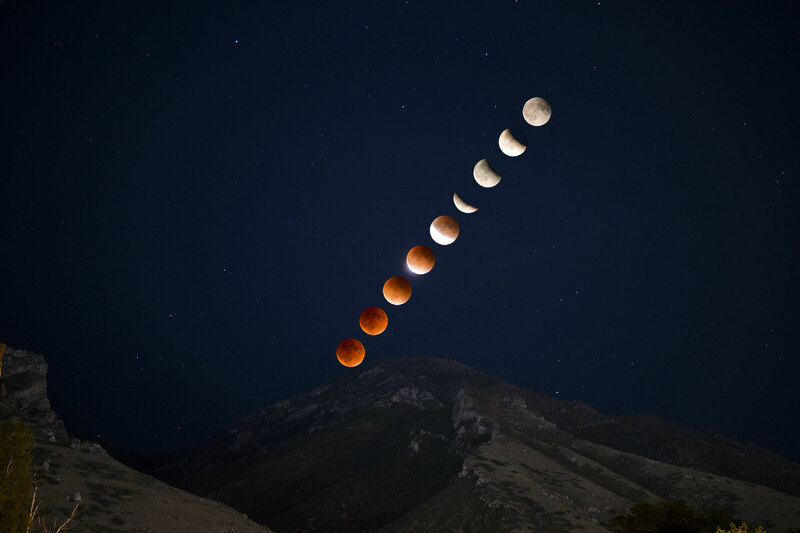 I placed these images in the context shot, aligning them with the trajectory of the moon as it rose above the horizon. While I was shooting these still images, I also wanted to record the progress of the moon as it emerged from the eclipse. It was too dark to shoot video and it would have taken two hours to show the entire process, so I opted for a time lapse. This gave me the advantage of still photography with the variable exposures and still showed the process over time. There were two challenges here: the need to adjust the exposure as the moon grew lighter, and the need to reset the framing as the moon moved through the view finder. I was able to capture most of this progression in three takes. The combination of the still photos against a single backdrop image and the time-lapse provded the illustrations I had hoped for. With every photo shoot, you learn from your mistakes. In 2033, I will be shooting with three cameras - one for stills of the entire scene shot at 30-second intervals using a 50mm lens, a second camera with a 300mm for time lapse and a third camera with at least a 500mm lens for closer stills of the moon, again shot at 30-second interals. In 1982 when the last super blood moon occurred, photographers were mostly shooting black and white film with a maximum safe ISO of 1600. Now everything is digital with high dynamic range. What will it be in 2033 with evener higher ISO and dynamic range capability? We'll just have to wait and see.